Businesses and SMEs in particular often run on tight margins. There are so many things that need to be paid for – marketing, office space, IT, staff, the list goes on – that turning a profit and making sure you’ve got enough money to pay yourself at the end of each month is no mean feat. Indeed, if it wasn’t for your entrepreneurial spirit, you wouldn’t be succeeding at all. But, an entrepreneur you are – and, as such, one of your key priorities is always to make savings wherever you can in your perpetual drive to improve your bottom line. It is with this in mind that you realise that it’s always better if you and your existing team are able to complete as many critical business tasks in-house as possible, rather than having to outsource or constantly request expensive call-outs for simple fixes. Marketing is one key area of your business where there is an abundance of opportunity to make such savings. Your marketing materials – your blogs, eBooks, whitepapers, social media posts, brochures, promotions – all need to be professionally designed in order to stand out and compete for existing and prospective customer attention. However, that’s not to say that you necessarily need to employ the services of a professional designer in order to produce them – especially since you can very affordably acquire the necessary skills for yourself and for your team. What you need is to make a short-term investment in training in order to reap long-term savings and benefits. I’m talking, of course, about equipping you and your team with the skills required to become professionally adept with Adobe creative software, and Adobe InDesign in particular, for this is a piece of software that no modern marketer should be without. Still not convinced? Here are 5 signs that it’s high time your business invested in InDesign training. Hiring in the professionals every time you need to make a simple design edit or update your product catalogue is not a cheap solution. Indeed, with the fast-changing business environment that we all find ourselves in, nearly all of our marketing and promotional content is unfortunately burdened with a very short shelf-life. A lot of this content, however, could in fact be revitalised for longer periods of circulation if only you had the skills to update and edit it from time to time. Indeed, with a regular redesigning of a PDF, whitepaper or product catalogue, it’s very possible to re-post and re-run your campaigns almost indefinitely. The design edits required are often only minimal to keep a piece of content appearing fresh and new every time you take it for a new campaign drive. And if you acquire the skills to make these edits yourself, you will be saving money on call-outs immediately, and injecting a longer-term value into every piece of content that you create. Let’s be clear – Adobe InDesign is not a simple program, especially for the complete novice firing up the software up for the first time. Indeed, InDesign is an extremely powerful piece of digital kit – but it’s complexity is merely down to its size (it’s massive – that’s what makes it so great! ), rather than anything else. Your competent marketing team is more than capable of learning how to use InDesign. I know this without even meeting them. As I say, it’s not that InDesign is particularly difficult to use, it’s just that it’s built for professionals, which means that it’s not designed to be user-friendly – and it’s enormous. By investing in a short training course for your staff, where an expert tutor will walk your competent marketing team through all of InDesign’s key tools and how to use them properly, they’ll be creating professional designs before the day is out. 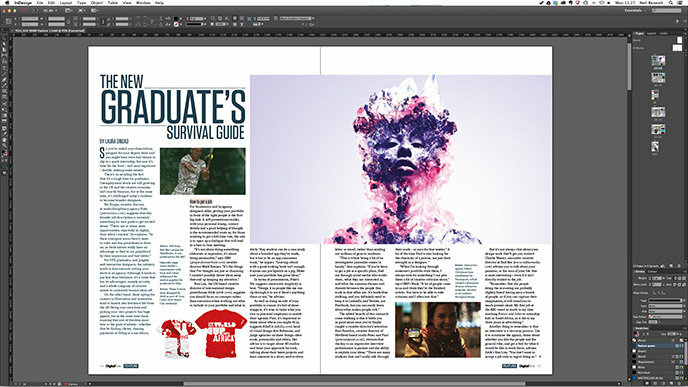 A subscription to Adobe InDesign is just £14.29 a month for small and medium businesses. A professional designer on call will charge more than that an hour. The math could not be simpler. If you’re calling in the cavalry every 5 minutes to make simple design edits or create your marketing materials on your behalf, you’re pouring money down the drain. This is a clear-cut sign that it’s time to invest in InDesign training at your business. You know it’s not good enough to be designing your marketing materials in programs like Microsoft Word (though there are a worrying amount of companies that still try and get away with this (they don’t)). However, if Word is the only software that you’re familiar with, then your only other option is to call in the Adobe whizz kids to turn your brochure or your eBook into something more presentable. There are alternative design programs to the Adobe suite, of course, but these are invariably inferior to InDesign. Using free online design tools can be useful up to a point, but the problem with these is that they usually come with a rather limited range of templates and images that are just dragged and dropped into place. Although this is simple, there is nothing here that will differentiate your marketing materials from the plethora of other businesses out there that are trying to get by using the same tools. Indeed, everything starts to look the same. By investing in an InDesign Training course, however, you are immediately setting yourself apart because everything that you create will be 100% original, and the end result will be of a vastly superior quality than anything you are able to create using free design tools online. A business is only ever as strong and successful as its marketing. You could have the best product or service in the world, but if no one knows about it, you’re never going to be able to sell it. If your marketing materials are poorly designed, then you can bet your bottom dollar your competitors will be exploiting this weakness and creating brilliant promotions that jump out ahead of yours. If this is happening, then the time to invest in some Adobe InDesign training is now. Indeed, your ultimate goal is to make sure that your marketing materials jump out ahead of your competitors’, and when your team is equipped with skills in using Adobe software, it’s your business that has the upper hand. Do you want your business to stand out above the rest? Do you want the skills to be able to produce your own beautifully designed marketing materials? 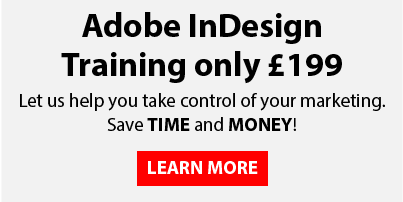 Sign up for one of our coveted InDesign courses today and equip yourself and your team with the knowledge and the confidence to use Adobe InDesign and all of its powerful, professional features. And don’t just take our word for it either – please take a moment to read our independently verified reviews over at reviews.co.uk to find out what our existing customers are already saying about our Creative Studios Courses.